Message boards : Generalized Fermat Prime Search : DO YOU FEEL LUCKY? Message 125596 - Posted: 29 Jan 2019 | 22:27:18 UTC - in response to Message 125595. "Accidit in puncto, quod non contingit in anno." Something that does not occur in a year may, perchance, happen in a moment. Message 125599 - Posted: 29 Jan 2019 | 22:57:18 UTC - in response to Message 125595. Message 125601 - Posted: 29 Jan 2019 | 23:30:33 UTC - in response to Message 125595. There are a couple of bases with no tasks waiting, but the fact that there is a couple probably means I am wrong. EDIT: and they have very high N, so forget that idea. Message 125604 - Posted: 29 Jan 2019 | 23:54:27 UTC - in response to Message 125595. Of course I do. Searching for large primes would be pretty boring if you didn't feel lucky. Yep, I'm pretty sure I just downloaded the next SR5 prime. Still haven't finished, though, or even started the task for that matter. Message 125607 - Posted: 30 Jan 2019 | 0:10:11 UTC - in response to Message 125595. Sure : I found a PPSE before starting TdP! Message 125608 - Posted: 30 Jan 2019 | 0:25:47 UTC - in response to Message 125607. So did I - first T5K prime for 6.5 years for me! Given that we're three mega-primes behind where we were last year, maybe we aren't so lucky. Unless we find three more mega primes in the next two days. I am also enjoying how such a short and vague post has sparked an emphatic reaction. Also, a misquoted Dirty Harry approves of this thread. Message 125621 - Posted: 30 Jan 2019 | 1:32:56 UTC - in response to Message 125615. Message 125628 - Posted: 30 Jan 2019 | 2:20:24 UTC - in response to Message 125621. Come what may, all bad fortune is to be conquered by endurance. (well, except on the 19th, when you will need to sprint). Message 125636 - Posted: 30 Jan 2019 | 7:06:13 UTC - in response to Message 125595. So either GFN15 or GFN22. I'm betting GFN22. Congrats to the finder if one was found! It's definitely GFN, it's in the GFN graphs in the server info - task status. I'ld say my best guess is either a GFN-23 or starting from a big enough "b" – a GFN-22-100M-prime search (or just a GFN-22-WR, but you would still need to start from a solid point, not just random "wherever the WR is at right now"). Like we have GFN-17Low and GFN-17Mega. "Do You Feel Lucky?" subproject is also mentioned on the editing your settings page in context that it doesn't have CPU apps. Message 125650 - Posted: 30 Jan 2019 | 13:17:43 UTC - in response to Message 125642. I think manual sieve will still give more credits. And in case it will be GFN23 project, GFN22 sieving results can be used for GFN23 for up to b=44,720. Message 125659 - Posted: 30 Jan 2019 | 15:42:46 UTC - in response to Message 125656. Message 125661 - Posted: 30 Jan 2019 | 15:47:23 UTC - in response to Message 125659. Message 125663 - Posted: 30 Jan 2019 | 15:57:41 UTC - in response to Message 125661. I am here for many years, but better statements I have not read before! Message 125669 - Posted: 30 Jan 2019 | 17:08:15 UTC - in response to Message 125595. Message 125686 - Posted: 30 Jan 2019 | 18:55:55 UTC - in response to Message 125669. It was 0 when I looked after you first wrote. If anyone still isn't sure what kind of thing this thread is about, I advise you to look closely at the list of the subprojects on the front page. Message 125687 - Posted: 30 Jan 2019 | 19:00:01 UTC - in response to Message 125686. I feel lucky about GCW and TRP. I also think that it is better to begin this subproject after TdP and GCW challenge. In 2009, PrimeGrid started running GFN-15 and GFN-16 on PRPnet using Yves Gallot's Genefer program. In 2010, GFN-18 and GFN-19 were also started on PRPNet. At that time, only one GFN-18 prime was known, and no GFN-19 primes were known. In February and March of 2011, PrimeGrid found the second and third known GFN-18 primes. Then, in October, we found the 4th known GFN-18 prime: 361658262144+1. 361658262144+1 is special: It's the first prime that we found using the new GeneferCUDA GPU program. The GPU version of Genefer was about 40 times faster than the CPU version, and represented a tremendous increase in computing power. Right after that discovery, John challenged us to use GeneferCUDA to find a GFN-19. Nobody knew if a GFN-19 even existed. Certainly, none had ever been discovered. "Why not?" said I. 4 days and just 16 tasks later, I discovered the world's first GFN-19 prime. At that point I had been crunching at PrimeGrid for a bit less than two years. Somewhere during those two years I learned about GIMPS. Their Mersenne prime search had found all the largest primes. The primes found at PrimeGrid, as big as they were, were still much smaller than the Mersenne primes. Seeing a chance to perhaps find primes as large as those found by GIMPS, I suggested that if we could make GeneferCUDA work on our BOINC server, where it would be more heavily utilized, we might start searching the GFN-22 range. All but the smallest potential GFN-22 primes would be larger than the then world record Mersenne prime, which was 12.9 million digits. Considering how fast GeneferCUDA was, we had a real shot at finding a world record prime. It was still a long shot, but there was a chance. I offered to port Genefer and GeneferCUDA to be native BOINC programs, an idea to which the PrimeGrid admins were amenable. So I ported the programs and they made the necessary changes to PrimeGrid's servers. We started running GFN-18 on BOINC in January 2012, and started the world record prime search with GFN-22 in February 2012. 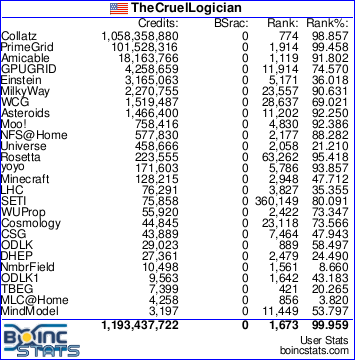 A year later, in February 2013, GFN-22 was searching numbers of about 16.5 million digits when GIMPS discovered a new world record Mersenne prime of 17.4 million digits. Three years later they found a 22.3 million digit Mersenne prime. Two years after that they found a 23.2 million digit Mersenne prime. Eleven months later, in December of last year, they found a 24.8 million digit prime, which is the current largest known prime number. GFN-22 is currently searching 21.6 million digit numbers. It would appear that the opportunity to find a world record prime with GFN-22 has come and gone. Even though we have an excellent GPU program, Mersenne has the advantage of being inherently easier to search, and their numbers grow in size faster because their search increases n (size is proportional to n) whereas a GFN search increases b (size is proportional only to log(b)). In addition, they only need to search prime values of n whereas we need to search all even values of b. Even though we have a faster program, their search still progresses faster overall. We're behind, and they're pulling away. After each of those 4 Mersenne discoveries, there were people here -- smart people -- who felt we should either increase b to be once again searching for a world record, or start an n=23 search, which would also be a world record search. The math, however, just doesn't make that a good bet. When we started GFN-22 it wasn't long before it was significantly larger than the current world record. We had some leeway. Starting a new world record search with larger numbers would have an even smaller chance of success. My uncle used to say, "Lotto is a tax on the mathematically challenged." I feel the same way about boosting GFN higher to be above GIMPS. It's not a good bet. They're more likely to find another prime before we find one of that size. So after each Mersenne prime, we've thought about making another world record search, and each time, we decided not to do it. Let me start by saying this is a real long shot. It borders on stupidity. But a lot of people want to do it, and it's going to be fun. We're starting up a new project called "Do You Feel Lucky?" It's going to be a GFN-22 search with b starting at 846,398. That's the first b not removed by sieving where b4194304+1 is greater than the current world record. Like GFN-17, we'll now have two GFN-22 searches running concurrently. Unlike GFN-17, however, this new search will not be a contiguous search. If a new Mersenne prime is found, we will increase b again so that we continue to search for a world record. GFN-22 is sieved to b=100M, so we can continue doing this search up to about 33.5 million digits. If we have to search larger numbers, we'll either need to sieve GFN-22 above 100M, or sieve GFN-23. "Lucky?" tasks will be slower than normal GFN-22 tasks because neither the OCL nor OCL4 transforms can be used. All GPUs should use OCL5. CPU tasks will not be available. These tasks are beyond the range of the 64 bit CPU transforms, so the 80 bit x87 transform must be used. Not only is this about 10 times slower, but it can't use multi-threading like the AVX and FMA3 CPU transforms can. CPUs would take forever to run these tasks. This project is a prime-finding project, so it will be available for TdP, or at least most of it. I'm not sure exactly when we'll turn it on. The internal name is "genefer_extreme". That's what you would use in app_config.xml or app_info.xml. Should it ever be necessary, the next names would be genefer_ultimate, then genefer_ludicrous, then genefer_plaid. Message 125717 - Posted: 30 Jan 2019 | 22:32:21 UTC - in response to Message 125716. The internal name is "genefer_extreme". Very nice. Looking forward to seeing if my 760 has *any* chance of completing a task reasonably! I'd like to offer special thanks to two people. The first is, of course, Yves Gallot, without whom none of this would be possible. Not only did Yves write the original Genefer program, but his subsequent Genefer OCL and improved CPU programs made it possible for us to expand the Genefer searches in ways that were previously impossible. The second person is Robish, who is simply the luckiest GFN searcher on the planet. If anyone is going to find a GFN-22, it's going to be him. Yes, this is actually the reason we said yes this time. We're going to need a ridiculous amount of luck to find a world record prime, and Robish seems to have the market cornered. Message 125719 - Posted: 30 Jan 2019 | 22:39:21 UTC - in response to Message 125718. I'd like to offer special thanks to three people. Message 125720 - Posted: 30 Jan 2019 | 22:43:18 UTC - in response to Message 125719. I found the GFN-19 in 16 tasks. Can he find the GFN-22 in 15 or fewer tasks? On a side note, Michael, do you you mind if I quote your uncle's wise words elsewhere? Message 125722 - Posted: 30 Jan 2019 | 22:48:37 UTC - in response to Message 125721. By all means you can quote it. It's a really good quote. :) If you want to attribute it (you do not have to), his name was Martin Metsch. Is it unlikely?..... Yes. Is it impossible? Eh no. Mike proved that after only 16 units on gfn19. If you're on the fence, just imagine the thrill of getting one! EXTREME!!!! I'll get the mountain dew ready :) Maybe it will max out a 2080. :) Awesome project, with the newer and faster hardware coming out everyday it's a grand idea! Good luck everyone. Let us know if more sieving is needed. Message 125727 - Posted: 31 Jan 2019 | 0:05:23 UTC - in response to Message 125720. Message 125729 - Posted: 31 Jan 2019 | 0:11:06 UTC - in response to Message 125716. Should it ever be necessary, the next names would be ... then genefer_ludicrous, then genefer_plaid. Historian by education, philosopher by inclination, contrarian by nature. Message 125730 - Posted: 31 Jan 2019 | 0:12:16 UTC - in response to Message 125716. Will it be added to the existing GFN badge or will there be a new badge created? Message 125733 - Posted: 31 Jan 2019 | 0:38:24 UTC - in response to Message 125730. It will use the existing badge. Also, we're increasing the long job bonus from 50% to 75% for Lucky. Message 125734 - Posted: 31 Jan 2019 | 0:41:45 UTC - in response to Message 125733. Message 125735 - Posted: 31 Jan 2019 | 0:49:35 UTC - in response to Message 125734. Almost a million per task! Now we're talking! Hell yeah!!!! Message 125736 - Posted: 31 Jan 2019 | 1:54:39 UTC - in response to Message 125735. I may have to buy that Volta after all. Who needs food, anyway? They say it's better to be lucky than good. But I think it's better to be good. Last year I felt lucky because I was good at aborting WUs a wingman had finished. But some people thought that was evil, not good, and put a stop to it. However, if PrimeGrid comes up in either the Pentathlon or a Formula BOINC sprint this year, I want to be good again. So, which will get better points, this project with its 75% bonus or PPS Sieve? I suppose it's PPS Sieve anyway, because I wouldn't be lucky enough to finish a WU with a wingman before whatever external challenge ended. Message 125746 - Posted: 31 Jan 2019 | 9:48:46 UTC - in response to Message 125716. What is currently holding it from being turned on? Message 125752 - Posted: 31 Jan 2019 | 13:13:11 UTC - in response to Message 125746. Message 125774 - Posted: 31 Jan 2019 | 16:44:12 UTC - in response to Message 125718. A big thanks to both Mike and Jim for setting this up. Going to be fun! For GFN 21 - 22 and Ultimate 22, is it still required to have high DP computing power ? (HD 7950 / 7970 / Titan Black etc) or are GTX 10xx / RTX 20xx running faster ? Thank You. Message 125778 - Posted: 31 Jan 2019 | 17:35:14 UTC - in response to Message 125777. The fastest cards will have big, modern DP like the Titan V or Tesla V100. Just behind them will be the RTX 20xx cards. The speed of the lower RTX cards (2070 and 2060) will be similar to just a bit faster than the GTX 1080 Ti and 1080, respectively. After that, it is a mix with GTX 10xx cards doing well. Message 125779 - Posted: 31 Jan 2019 | 17:53:05 UTC - in response to Message 125716. So DP is out, and a 2080ti might be on par with a Titan V (individual clocks and cooling would determine the difference). Message 125786 - Posted: 31 Jan 2019 | 18:42:18 UTC - in response to Message 125777. Grebuloner's answer (right before mine) is correct: DP won't matter for Lucky, or Extreme, or whatever we end up calling it. Message 125853 - Posted: 1 Feb 2019 | 2:58:57 UTC - in response to Message 125607. Unless there's any more problems, this project is live. Message 125925 - Posted: 1 Feb 2019 | 18:20:05 UTC - in response to Message 125907. I understand these tasks will take a long time to crunch. Any idea on how much longer than a "normal" GFN-22 ? It's been a while since I last crunched a GFN-22 and it took around 75 hours on a GTX 1060 3GB. Mike said in the chat that they're about a third longer on his 1060. I'm currently running one on a 2080 and it should take 29-30 hours. Message 125931 - Posted: 1 Feb 2019 | 18:51:04 UTC - in response to Message 125927. Then I guess it'll take me around 4 days and 4 hours. I´'ll give it a try, after I finish a current GFN-20 task. Message 125941 - Posted: 1 Feb 2019 | 19:46:28 UTC - in response to Message 125721. Message 125943 - Posted: 1 Feb 2019 | 19:55:04 UTC - in response to Message 125941. I never said uncle Manny invented the quote himself! But I'm pretty sure I heard it from him in the 70's or 80's, so at least that predates many (but certainly not all) of the documented prior versions of the quote. Regardless of what version, or from whom it originated, I really like that quote. Especially as I hand over money to buy Lotto tickets! Message 125946 - Posted: 1 Feb 2019 | 20:02:57 UTC - in response to Message 125716. Message 125947 - Posted: 1 Feb 2019 | 20:05:55 UTC - in response to Message 125946. My understanding is that's an arbitrary limit, and could be raised if we need to do it. Message 125949 - Posted: 1 Feb 2019 | 20:15:20 UTC - in response to Message 125943. Just in case, JeppeSN's link has the oldest mention of that / similair quote for 1662, then 1733, 1884. It's a fairly old saying! Message 125965 - Posted: 1 Feb 2019 | 22:45:54 UTC - in response to Message 125907. Eagerly waiting for some stats in relation to the average GPU elapsed time with these units. 28 "Do You Feel Lucky?" tasks are currently under work. Message 125973 - Posted: 1 Feb 2019 | 23:00:22 UTC - in response to Message 125965. Thanks, I missed that. I also have removed the CPU stats from the three projects that don't have CPU tasks. The first tasks to be finished will be from RTX 2080 or 2080 Ti GPUs, so the first numbers you're going to see will probably "average" around 24 hours. Message 125974 - Posted: 1 Feb 2019 | 23:02:03 UTC - in response to Message 125966. 27 "Do You Feel Lucky?" tasks are currently under work. I mentioned on the WUProp forums that we had a new app running. That should bring in some players. They're always desperate for more apps. Message 125981 - Posted: 1 Feb 2019 | 23:51:39 UTC - in response to Message 125974. Is WUProp still being updated -- I thought it was dead? Here from the WUProp post. It's not dead. Shared this thread on OCN forums. Now after Robish was that much hyped I looked at Robish's Badges... What the? TdP 2019 has just started yesterday and Robish ALREADY found a prime? Put him into the Lucky Project. 2 Tasks, world record prime done. Message 126001 - Posted: 2 Feb 2019 | 9:23:12 UTC - in response to Message 126000. Message 126004 - Posted: 2 Feb 2019 | 10:26:31 UTC - in response to Message 126001. Message 126006 - Posted: 2 Feb 2019 | 11:14:21 UTC - in response to Message 126000. Message 126007 - Posted: 2 Feb 2019 | 11:21:33 UTC - in response to Message 126006. Mike, can you tell credits per WU with 75% bonus? Message 126013 - Posted: 2 Feb 2019 | 12:52:31 UTC - in response to Message 126006. And given that I haven't found a prime in a year, it seems to be the opposite. Message 126014 - Posted: 2 Feb 2019 | 12:56:48 UTC - in response to Message 126013. Message 126015 - Posted: 2 Feb 2019 | 13:40:48 UTC - in response to Message 126007. I haven't figured it out. We'll all just have to wait and see! Message 126018 - Posted: 2 Feb 2019 | 13:49:25 UTC - in response to Message 126015. My guess, just over 800k. Message 126028 - Posted: 2 Feb 2019 | 15:37:33 UTC - in response to Message 125989. I have a Lucky wu running on my 1080Ti, it's using 98% of the gpu and 0.282% of a cpu core and estimates it will finish in 1 day 21+ hours after running just under 30 minutes. Think I need to buy a RTX before giving a try. Message 126031 - Posted: 2 Feb 2019 | 16:14:58 UTC - in response to Message 126030. Unless it spees up a bit, the estimated time here is around 4.5 days for the Extreme GFN-22 task. This is a 2.5 year old Galax GTX 1060 3G (small overclock). 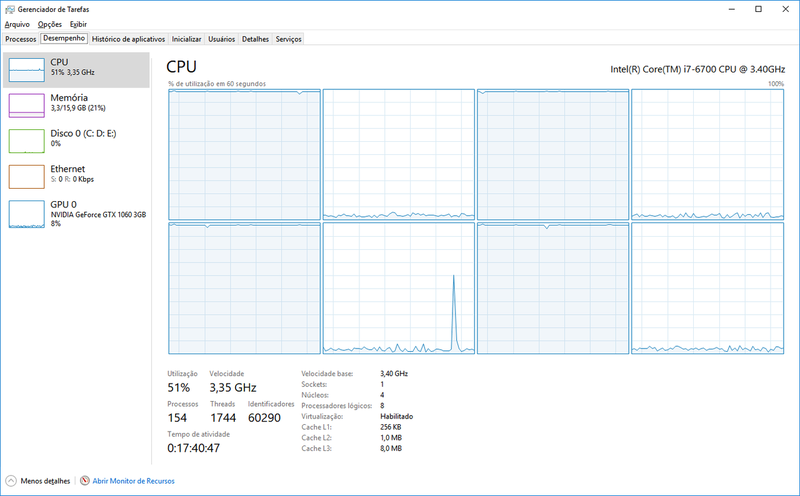 Running simultaneously, are 4 PPSE (single threaded = -t 1), averaging 12 minutes each task. HT is on, computing preferences set at use at most 50% of the CPUs (in BOINC Manager). An RTX 2080 Ti has returned the first Lucky task. Message 126051 - Posted: 2 Feb 2019 | 20:35:17 UTC - in response to Message 126015. Now I have: 943977.2426 is the minimum credit for the smallest WU. Message 126052 - Posted: 2 Feb 2019 | 20:53:00 UTC - in response to Message 126050. Message 126053 - Posted: 2 Feb 2019 | 20:56:29 UTC - in response to Message 126052. Message 126054 - Posted: 2 Feb 2019 | 20:56:43 UTC - in response to Message 126051. Message 126055 - Posted: 2 Feb 2019 | 20:58:29 UTC - in response to Message 126053. Message 126057 - Posted: 2 Feb 2019 | 21:03:58 UTC - in response to Message 126052. Message 126087 - Posted: 3 Feb 2019 | 7:50:34 UTC - in response to Message 126057. I wonder if I should try one on my GTX 550ti??? Message 126088 - Posted: 3 Feb 2019 | 8:00:52 UTC - in response to Message 126087. Up to you but chances are miniscule so try for smaller ones to get your p badge maybe. Message 126092 - Posted: 3 Feb 2019 | 10:59:39 UTC - in response to Message 126088. Message 126094 - Posted: 3 Feb 2019 | 11:47:00 UTC - in response to Message 126092.
my 12 rtx 2080 version ti nad oc tubro and 2 gtx 1080 are ready!!! good luck to every Volunteer…. let's set a period of time, in which we should win a World Record??? will 5 years period to find a most lucky numer be enough??? Message 126095 - Posted: 3 Feb 2019 | 12:20:28 UTC - in response to Message 126094. You wouldn't have to mention it on WUProp because I believe PrimeGrid-apps are being intaken automatically there. I have one task running on a GTX 960 and it makes my host a bit sluggy. Cannot play without stopping the task and even doing other work is slighty hard, so I let it run for now. At the current rate it will finish with a 7-day runtime - good that the deadline is long enough because at the end of this week I have to turn the host out for a few days. Message 126103 - Posted: 3 Feb 2019 | 14:42:02 UTC - in response to Message 126102. ...I do feel lucky still. Message 126109 - Posted: 3 Feb 2019 | 15:18:46 UTC - in response to Message 126096. Well, I was speaking of myself mostly! True, but it takes a day or two for that, and I wanted to give you'all a head start. That's coming. There's just been too many things on my plate between starting this project and TdP. Well, I bet it won't work without having the system extremly lagging - if it works anyway. It will definitely work, but even my GTX 1060 is laggy. Message 126111 - Posted: 3 Feb 2019 | 15:42:15 UTC - in response to Message 126103. Same here in Linux. Normal for an OCL app in Linux. Message 126112 - Posted: 3 Feb 2019 | 15:50:50 UTC - in response to Message 126103. I can't see this here. Message 126117 - Posted: 3 Feb 2019 | 16:26:12 UTC - in response to Message 126087. I look at all of your three computer you have. All three have CPU with GPU. So why you dont you use Intel GPU for video output, and GTX 550ti got GFN23? Message 126118 - Posted: 3 Feb 2019 | 16:57:09 UTC - in response to Message 126117. Message 126120 - Posted: 3 Feb 2019 | 17:11:28 UTC - in response to Message 126118. I never so any difference in speed using iGPU on Intel processors: maybe it is just me, . And for me it is very efficient solution. Estimated time for xxxxxxx^4194304+1 is 98:40:00 (GeForce GTX 1060 6GB). Message 126142 - Posted: 3 Feb 2019 | 19:17:40 UTC - in response to Message 126095. Message 126144 - Posted: 3 Feb 2019 | 19:23:54 UTC - in response to Message 126142. Message 126148 - Posted: 3 Feb 2019 | 20:20:57 UTC - in response to Message 126144. As we see there is possible get about 80 000+ second per task on some hi clocked cpu and custom nvidia Gf.cards with max clocked from factory. Message 126159 - Posted: 3 Feb 2019 | 23:24:10 UTC - in response to Message 126158. The link you provided results in "You can't view this result yet." Message 126160 - Posted: 3 Feb 2019 | 23:26:28 UTC - in response to Message 126157. One would have to be Extremely Lucky to find a prime in the very first WU. Good news: After one day, I have a wingman for my Lucky task. I won't have to wait forever for credit. Bad news: Even though I had a 1 day head start, my wingman's probably going to finish 2 days before me. Message 126162 - Posted: 3 Feb 2019 | 23:57:29 UTC - in response to Message 126161. Almost no chance against those mighty GPUs. A normal user wouldn't be able to see that information, right ? If click for details on the current task I'm crunching, I get "tasks in progress	suppressed pending completion". Message 126163 - Posted: 4 Feb 2019 | 0:03:39 UTC - in response to Message 126162. Right. We had some issues last year that caused us to suppress certain information to maintain fairness for all. Message 126164 - Posted: 4 Feb 2019 | 0:18:37 UTC - in response to Message 126163. I believe it was a decision made (taken?) during last year TdP. Lots of interesting things happened then. Also the idea of putting (1st) in the task list was given by composite and you quickly implemented it. Message 126170 - Posted: 4 Feb 2019 | 5:31:13 UTC - in response to Message 126164. Some days are better than others for me. Full credit to Mike for having the inspiration for that concise representation. Wrong page. I'm thinking of changing the page that shows 20 tasks at a time. Message 126213 - Posted: 4 Feb 2019 | 16:50:06 UTC - in response to Message 126170. "Be careful what you ask for." Message 126233 - Posted: 4 Feb 2019 | 20:33:39 UTC - in response to Message 126211. There's an interesting benchmark here. How come a 2080 Ti with 420 FP64 flops complete the wu quicker than a Titan V with 7.450 FP64 flops? Message 126234 - Posted: 4 Feb 2019 | 20:58:00 UTC - in response to Message 126233. Lucky doesn't use DP because B is beyond the OCL limit, which is approximately 610K for N=22. Only the original OCL transform (and the similar and obsolete CUDA transform) use DP. All the other OCL transforms (OCL2, OCL3, OCL4, and OCL5) exist to circumvent the B limit when using DP. Message 126242 - Posted: 5 Feb 2019 | 11:54:21 UTC - in response to Message 126211. There's now 38 completed tasks and 4 validated WUs. The 1070s now have had time to finish. * I don't know why that 1070 Ti (it's a single result) was slower than a 1070. Message 126244 - Posted: 5 Feb 2019 | 11:59:06 UTC - in response to Message 126242. That 1070ti is mine Michael, it's running with no O/C, maybe that's it or maybe it's the +40*C temps we've had in Oz???? Message 126245 - Posted: 5 Feb 2019 | 12:06:18 UTC - in response to Message 126244. Message 126246 - Posted: 5 Feb 2019 | 12:14:37 UTC - in response to Message 126245. A GFN22 tak I ran on my 1070 Ti a while back took about 184,000 secs, so I guess so. Well, these units are harsh on my 1080s, maxing out their fans, unlike the easier going units do. So I've ordered waterblocks for them. If I disappear suddenly, you'll know why. Message 126289 - Posted: 5 Feb 2019 | 16:22:10 UTC - in response to Message 126287. Message 126293 - Posted: 5 Feb 2019 | 16:42:37 UTC - in response to Message 126287. That surprises me a bit. My GTX960 is taking my task more or less "lightly" and doesn't sound louder than usual. While usage is at 100% of course, the fan is "only" at 70% with around 1800 rpm and temperature is around 70°C. However, have to add that my comps case is opened by default. I guess it would be a bit higher if it was closed completely. Message 126298 - Posted: 5 Feb 2019 | 17:06:54 UTC - in response to Message 126293. These units push the temps to 85c on them, and that maxes the fans out. On the less demanding units, the fan isn't audible effectively. Message 126325 - Posted: 5 Feb 2019 | 22:13:31 UTC - in response to Message 126309. Wow, I'm surprised the driver lets it get that hot. The desktop Pascal GPUs seem to limit the temperature to a maximum of 82C. Message 126327 - Posted: 5 Feb 2019 | 22:19:16 UTC - in response to Message 126242. There's now 52 completed tasks and 5 validated WUs. The 1070s now have had time to finish. Message 126328 - Posted: 5 Feb 2019 | 22:21:05 UTC - in response to Message 126325. Message 126334 - Posted: 5 Feb 2019 | 23:00:50 UTC - in response to Message 126328. I figured out that it was Lucky + Skype that was causing most of the lag. Turned off Skype and it's much better. 67% complete on my GTx 970 ha. ETA says 2d8h to go. Message 126345 - Posted: 6 Feb 2019 | 2:24:08 UTC - in response to Message 126342. Message 126350 - Posted: 6 Feb 2019 | 3:18:08 UTC - in response to Message 126327. There's now 61 completed tasks and 6 validated WUs. We have our first V100 result. Message 126351 - Posted: 6 Feb 2019 | 3:40:26 UTC - in response to Message 126350. Message 126354 - Posted: 6 Feb 2019 | 4:43:26 UTC - in response to Message 126350. Message 126381 - Posted: 6 Feb 2019 | 15:21:01 UTC - in response to Message 126354. It looks like the TITAN V and the Quadro GV100 are essentially 2080 Ti equivalents for Nvidia's other product segments. The Tesla V100 is in a class by itself, probably due in large part to the much-better-than-PCIE-interface that's special for that GPU. The settings for the 2080 crunching Lucky I had set are +50 clock and +400 memory.... runs stable, heat not the worst it could be. Actual speeds were 1950 and 7199. Thought i'd see it get to 85c but I didn't notice it that high. Peaked around 78-79C and was more in the 74c range for most of it. Sometimes the memory controller load would be 98% other times 68%, that greatly affected the temps. What caused the change in memory controller use I really am not sure. Benchmarking it b4 running an actual test showed temps at 85C and memory controller usage around 98% as long as I had it running. I believe some others saw similar with less heat than anticipated. I am not complaining Michael Goetz only saying. Message 126406 - Posted: 6 Feb 2019 | 23:09:34 UTC - in response to Message 126405. That's not possible the way we're set up, sorry. Message 126407 - Posted: 6 Feb 2019 | 23:10:27 UTC - in response to Message 126398.